Special needs children learn well being homeschooled. Resources here for homeschool support, legal assistance, curriculum, plans, and more. This is a free newsletter, but donations are accepted newsletter for homeschooling families with Special Needs. To Order: Email Jean Kulczyk: [email protected] or Write to: At Our Own Pace, 102 Willow Drive, Waukegan, IL 60087. The percentage of children with special needs receiving academic instruction at home has substantially increased since a resurgence of homeschooling during the 1990s. In light of the increasing number of families choosing to homeschool, increased support in the form of special education services from the public schools would serve to improve the homeschooling experiences of many students with disabilities. • Do you have a child with a learning problem, and you feel apprehensive about teaching him at home? 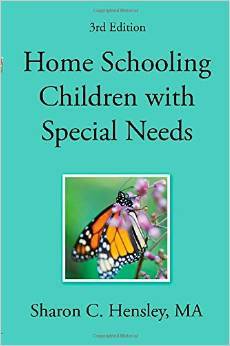 • Do you need help locating the best resources for homeschooling your child with special needs? • Do you find yourself confused and intimidated by the professional jargon related to special education? • Do you struggle with discouragement related to your child’s progress in learning? If you answer “yes” to any of these questions, “Home Schooling Children with Special Needs,” will help you. • You’ll gain confidence to teach your child at home. • You’ll find resources and guidelines for planning an effective homeschool program. • You’ll learn to understand the vocabulary and ideas that you need to make good decisions for your child. • You’ll discover emotional strength and learn to identify the attitudes that support effective teaching. Sandy’s Master’s Degree Project focused on homeschooling children with specific learning disabilities. You will find statistical data stemming from informal polls listed on Homeschooling Listservs. Folks often ask me to recommend curriculum for their children with special needs. By Kathy Kuhl. NACD is an international organization of parents and professionals dedicated to helping children and adults reach their full potential. NATHHAN is a Christian organization that offers advice and links for those with challenged or disabled homeschoolers. They can be contacted at [email protected]. Are you homeschooling a child diagnosed with ADHD, autism, a medical condition or a learning disability? Are you a special needs parent? Then “like” our Facebook page and get support, encouragement, and great ideas! Heather is a Christian homeschooling mom of 5. Passionate special needs advocate, speaker, reviewer, and writer. Enjoying a wonderful life of an occasional extreme couponer, homemaker, and DIYer. Terri Harmon has a series of three articles about homeschooling special children. If you are a parent of a special child and considering homeschooling, you undoubtedly have many questions and concerns. You’re not alone. By Janie Bowman.